RAZ Mobile is setting out to help non-profit organizations better engage with their supporters via the power of mobile and social media. Their recently launched mobile marketing platform enables any non-profit organization to create a full-featured, customized mobile website in a matter of minutes. The sites integrate seamlessly with social media channels and incorporate secure donation processing. As supporters move to the mobile web and engage in social media channels, it’s important for non-profits to evolve along with them and pro-actively engage their supporters where they are most active. Social: IRL recently spoke with RAZ Mobile founders Dale Knoop and Brad Kropf to learn more about their Kansas City-based startup and how non-profits might benefit from using their platform. You can learn more about RAZ Mobile by visiting their website, or connecting with them on Twitter or Facebook. Update: Since this post was originally published, we have been pleased to welcome RAZ Mobile as a new Social: IRL sponsor. Could you please share a little about your background – who founded the company and why? RAZ Mobile was founded by Dale Knoop and Brad Kropf and they each have a deep background in mobile data services. Among them both are dozens of patents and the idea for RAZ Mobile stemmed from their desire to help non-profit organizations deal with the coming donor cliff. Most donations currently come from direct mail and most of these donors are of an older demographic profile. Our goal is to drive innovation into the non-profit space, help them reach new donors, and ultimately benefit those in need. What is the key non-profit challenge you’re setting out to solve, and what type of feedback have you see as you’ve started introducing RAZ to regional non-profits? We talked about the coming donor cliff. Nothing beats having a mobile presence when it comes to donor engagement and fundraising. The great thing we’ve seen in the first month we’ve been in the market is the phenomenal response from causes. They’ve seen their own mobile sites on their phones and, from their own experiences with the sites, quickly understand the need to add more mobile-friendly channels for communication and fundraising. We’ve got some very traditional non-profits coming on board and we were amazed at the speed at which they started talking about tactics for using RAZ Mobile in what they do today. 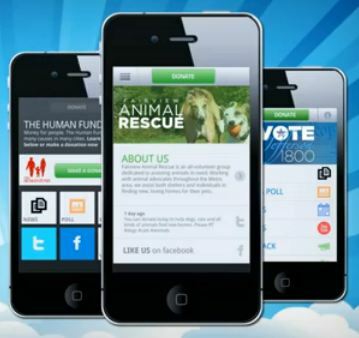 Besides creating a mobile optimized experience, what other benefits does the platform offer non-profits? In addition to having a mobile optimized experience to share with supporters, non-profits can also process supporters’ donations in a matter of seconds. RAZ Mobile is priced so that causes can afford to experiment with a low cost solution and refine their tactics and strategies. Creating an app is both expensive to build and to maintain. Carrier-billed solutions can cost up to 50% of the donation made and the cause doesn’t know who the donors are. RAZ Mobile was designed to solve all these challenges and make giving easy, secure and quick for donors since they don’t want to pinch and swipe your PC site on their phone. Research says they’ll give up. In the time it takes to even find the Donate button on their PC site, with RAZ Mobile your donation could have been made and a receipt already sent to your inbox. Could you share a little about the technology involved? RAZ Mobile is a cloud-based solution which uses the browser to render the cause’s mobile site. Under the hood are several hundred thousand lines of code and links to social media like Facebook and Twitter and a growing suite of reporting tools. We chose RAZ Mobile to be a browser-based solution in order to achieve the largest scale for our clients. We also use industry standard credit card processing technology in order to ensure the maximum speed of donations going to our customers and a high-level of security for the donors. There are, of course, other mobile solutions being offered. Could you tell us what sets you apart? What unique user-benefits is RAZ Mobile able to bring to the table? RAZ Mobile makes donations super easy and fast for donors making repeat donations. At the end of making your first donation a donor can create a secure PIN to store their credentials for future donations, making all future donations to any cause using RAZ Mobile just a few taps on their smartphone. The other two aspects that set us apart are a commitment to service to our clients and making sure that our product for both causes and supporters is simple and yet incredibly powerful. We actually have a client who evaluated several other solutions that are out there now and they chose RAZ Mobile. We are really honored to be selected and we think others will see the same thing. It’s been just a month since RAZ Mobile launched. Could you give us a quick review of initial progress and where things go from here? One month since launch we’ve got a handful of clients using RAZ Mobile and many more coming. Each of them has significant efforts in other channels like print and digital and they easily see the need to use RAZ Mobile to add the mobile channel to what they’re already doing today. We’ll have some great stories to share soon and the cool part about what RAZ Mobile offers is an easy way for any cause to educate their supporters on an ongoing basis, anywhere, anytime and when donors give there’s someone in need who will benefit. That’s a great thing to support and we are very excited about the future for causes who are really worried about the age of their donors and the coming problems with our postal service. We also have some amazing technical enhancements coming that are going to further advance our reputation as the leading innovator in the mobile engagement and fundraising space. We’ll be announcing them as they happen. Some will involve some great partners so we’re pretty excited about what’s to come. We have a full pipeline which includes some patent pending features. Social: IRL sponsor ManageFlitter, recently hit an impressive milestone – 1 million users. To celebrate, ManageFlitter is giving away 50 lifetime Pro accounts. Visit their website for details and to learn how to enter to win. Deadline for entries is end of day August 20. With both free and Pro versions, ManageFlitter offers users a powerful set of tools to “work faster and smarter with Twitter.” It helps users manage and grow their Twitter accounts, and identify and connect with relevant Twitter users via advanced search and follow tools. It also includes Twitter analytics and a unique PowerPost interface to help ensure tweets are sent at the optimal time for a specific audience. We’ve been proud to have ManageFlitter as a Social: IRL sponsor and we congratulate them on their continued growth and on reaching this special milestone. Great content can be shared in 140 characters, but can soon disappear in the Twitter timeline. 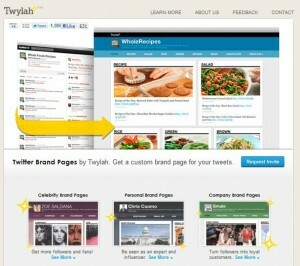 Two tools we recommend for extending the life of your Tweets and adding value to your brand: Twylah and Timekiwi. Both tools aggregate your tweets into a single page that you can attach to your website or otherwise promote as home of your latest social media content. Apart from extending the life of your tweets, the content is also presented in a clean and easy to read format that is accessible to non-Twitter users as well as your regular followers. Twylah presents your latest tweets in a single landing page. Your tweets are sorted and grouped by subject matter, and links are extracted to highlight the content you’re sharing, not simply the tweet itself. Twlyah also provides a Twitter client giving you the option of sharing content direct through the application. In that case, click thrus take users to your Twylah landing page to view the content, along with other similar content you have previously shared. The service is free for personal or business users. 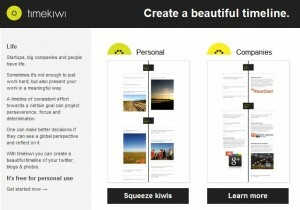 Rather than a landing page format, Timekiwi aggregates your Tweets in to a timeline. With Timekiwi you can also incorporate Tumblr, Posterous, WordPress, and Instagram into a single timeline. Links are not extracted but photos are, and it’s photos that really add visual impact to the timeline. The timeline is easy to scroll through and can be displayed in either a vertical or horizontal format. Timewiki is free for personal use. Business plans are $5 per month or $50 per year.